When in your training do you start to care about how the horse is holding his head and neck? One thing most people agree on is that the horse should not appear resistant; head tossing, gaping mouth, pulling reins away from the rider, etc. I enjoy training horses to be willing and soft and then, for the most part, I let the head carriage be determined by the horse. I take into account how the horse is built. When people are concerned about the horse carrying its head low I recommend them buying or starting out with a horse that, when observed in the pasture, lunge line or round pen, naturally carries their head low. The bigger issue for me is how the horse carries themselves through their withers. It is important that the horse keeps his withers elevated for maximum athletic ability. You can see in Episode 24 at the 5 minute mark how Jac is desiring to drop his head as a side effect of the bending and counter-bending. I will actually discourage Jac from dropping his head for a few months at speed, until he has a solid lead change and slide. Then I will allow him to drop his head if he wants after that. 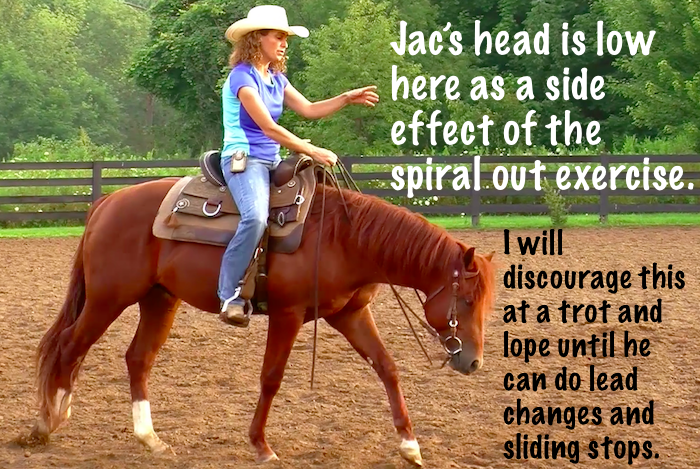 Jac doesn’t understand that dropping his head too fast will make learning the lead change and the slide more difficult. I have trained horses for western pleasure, reining, trail, lunge line and general trail riding. I currently choose to train for a discipline where I can generally win without aiming for a specific headset. If I chose to train for a different discipline I wouldn’t have a problem with aiming for a specific headset…but I would start with a horse where the natural head carriage had my work already done. O.M.G. Stacy thank you SO much for bringing this up. This is such a fundamental question, and such an issue in the horse world. I’m actually a little baffled by all the cool and very mild answers. My contribution will be way more extreme. First off, let me state that my young horse (4 yrs old) is a Portugese Crusado (half full blood Lusitano, half… something else unknown). As such (Portugese and Spanish breeds have it in common) he is quite built “uphill”, and has a naturally high head carriage. Actually, he’s getting along pretty well in his training and is quite soft on the bit and will break at the poll and soften up any time I put contact on the reins. He’s quite comfortable with breaking at the poll and tucking his chin nicely in. But even so, his NECK tends to be very erect, and I can see/feel it’s very tricky for him to extend his neck and lower his head, as the Western disciplines would require he does. It doesn’t help that I’m trying to introduce him to Reining maneuvers. Here in Europe when people think “Western”, all they care about is a horse going around with its head between its knees. Reining is my discpline of choice, but I have a love/hate relationship with it as I see every rider and trainer I come across pulling on the bit (often unmercifully) as soon as the horse tries to come out even by a smidge, out of this totally unatural low carriage that is asked from them at all times. 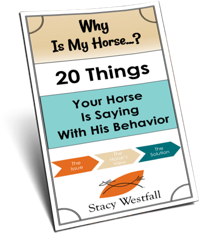 I’ve tried to ask many horse trainers, more or less famous, many times, and I have never received a SINGLE answer to my question “WHY do you ask your horse to perform with his head below its knees ?!?”. My guess is that there is NO reason, other than what is fashionable and gives a (very false) look of a horse freely and naturally carrying himself in a “pretty” arched attitude, while in fact the horses are forcefully and ruthlessly kept in this frame. And if I honeslty ask myself : would I want my horse to have a lower head carriage, Western style ? YES !! Absolutely ! But I’m NOT (ever) going to use gimmicks or become obsessed about getting it, since it is so against his conformation. Soft and broken at the poll is probably the best I’ll get from himn and if I want lower, I’d be better off getting a naturally low headed breed. Now Stacy if you happen to read this comment, I’de be VERY interested to hear your take about this obsession of the low head among Reiners nowadays ? (I’m not even mentioning Pleasure horses, that are a true ordeal to watch…). I quit showing in western pleasure in the 1980’s when the peanut roller (low head carriage) was popular. Even now I hate to watch a western pleasure class. The horses look like they are crippled. I love reining but some of the trainers are asking for the low head carriage. It just doesn’t look natural. 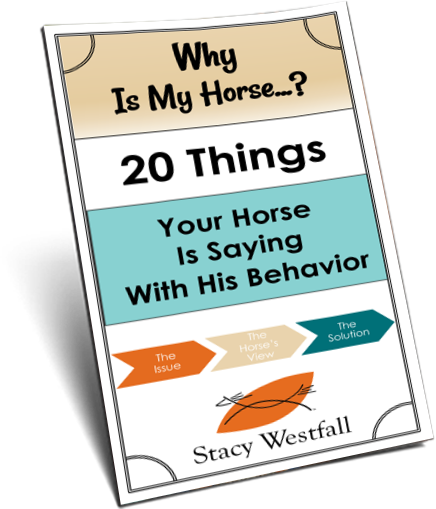 I agree with Stacy…how a horse carries his head depends a lot on the way the horse is built. We are bringing home a horse on Saturday who needs trail miles, (and we needed a borrowed trail horse) She has a very high headset and the trainer we are getting her from said not to worry about it, that the horse will find it’s comfortable spot with time. We don’t show but this horse will be used for jumping cross country someday. She loves the jumps, I can’t figure out how she sees well enough to gauge her strides with her head up like that….I’m hoping with lateral work and time she can be more comfortable with her head at least level. Stacy… when I first watched this video…..I have wondered about what you said: “Jac is desiring to drop his head as a side effect of the bending and counter-bending.”….. when you say side effect…. 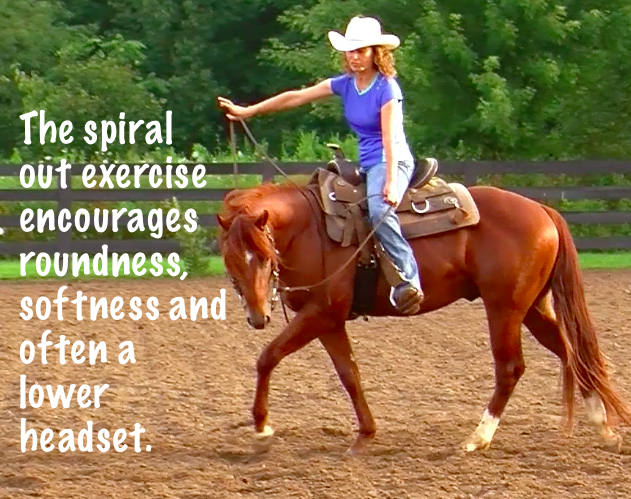 does that mean ALL horses do the head dropping/stretching when you are teaching the bending???? thanx! Yep…that’s what I’m saying. When done properly the horses want to lower and stretch. I’m not saying all of them are built to want to be that low all the time, but it does help all of them learn how to round and carry themselves collected. ohhhhhh ok……… I know sitting at the computer to long makes me want to stretch my neck like that sometimes….haha…. thanx!! Right on and so true….. I ride dressage and the idea is that the head carrriage should reflect how the horse is using his/her body. Not that many don’t try for a ‘short cut’ with gadgets etc. I agree that you buy the horse that’s conformation suits what you want him to do.